Yes, I agree, Baronloft! I popped in yesterday afternoon to see what a mess they might have created- & I wasn't 'disappointed'! Hideous, ghastly, rubbish etc don't begin to do justice to it? I just went into the loo before risking asking for a pint, having clocked all the appalling 'improvements'; went to the bar to register my disappointment; yet, by then, didn't have the 'courage' to ask how much the beer had gone up! I expect Special is about £4.50 now? The only upside was that the gents' loo door had been oiled, apparently, so didn't squeak & creak so much, & was a bit more easy to open! Sad, sad, sad...Bring back The Builders, in which I used to drink in the 80s! Also, it is shameless of Young's not to credit on the pumpclips that their beers are now being brewed by Wells? Neither Special nor Ordinary is a patch on what I was brought up on from the 70s 'til recently. Obviously re-decorated by the same 12 year old that has destroyed The Tabard ! 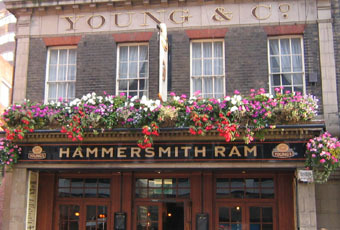 The Ram is closed for refurbishment for 2/3 weeks more, I believe! My husband and I had a meal here last week. Never again! 2 out of 3 advertised ales my husband wanted were "off". The wine selection was mediocre and my white wine was not chilled. The menu was unimaginative but nevertheless the food was ok. The staff were disinterested and seemed more interested in gossiping behind the bar than serving the customers. However, the most off putting aspect of this pub is the poor attention to cleanliness and hygiene, especially in the toilets, which were very dirty and smelly.